Slack was a butcher and known as the “Knight of the Cleaver” who not only “tossed fights” but also assisted in other “cross affairs of the knuckles” – great descriptions of the day-.Slack won due to fearlessness, rather than ability, and was credited for introducing the “Chopper” – appropriate given his job as a butcher – which is the equivalent of the rabbit punch. Slack’s reign was from 1750 to 1760 a decade when boxing went into decline as the public had lost faith in the sport due to the allegations of shady deals made by prominent fighters. The Duke of Cumberland backed Slack against Bill “ The Nailer ”Stevens” for the crown who had the Duke of York as his patron, facts in themselves speaks volumes for the quality of judgement the two Dukes had. The fight took place on 17th June 1760 with “The Nailer” , someone notorious for his double-crossses –winning the title. Slack then went on to back George Meggs against Stevens, who he hid bribed to lose, and received a fee for the fix of fifty guineas from Meggs. Meggs soon lost the title to Baker Milson who then lost to Tom Juchau. Then came Bill Darts who held on for nearly five years until in 1769 Tom Lyons “The Waterman “ took the title. However Lyons was far from being overwhelmed by his new found fame and within two weeks went back to his more peaceful job of ferrying People across the Thames. Darts regained the title but then lost it in what is said to be record time – the fight lasted less than a minute – to Peter Corcoran. The first Irishman to win the title. 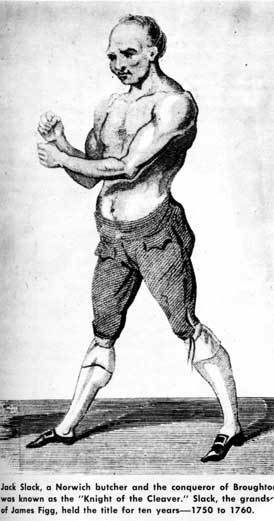 rests more securely on his excellence with the cudgel and smallsword than on fisticuffs, and the real father of the ring was John Broughton, who was Champion from 1738 to 1750. Broughton had a famous place of entertainment known as the Amphitheatre, in Hanway Yard, Oxford Road, near the site of a like establishment that had been kept by Figg. Here, with pit and gallery and boxes arranged about a high stage, displays of boxing were given from time to time, and here it was that sportsmen first learned to enjoy desperate struggles between man and man. As has already been shown, Broughton formulated the rules which for many years to come were to govern fighting, and which, much as they leave to the imagination as well as to the discretion of officials, tell us with the utmost simplicity the conditions under which men fought. Broughton's fight with Slack can by no standard be called great, but it has its peculiar importance in showing us how a certain degree of skill hampered by over-confidence and lack of training may be at the mercy of courage, strength, and enterprise. Broughton's knowledge of boxing, compared with the science of Jem Belcher and Tom Spring, must have been negligible; but years of practice must have taught him something. As far as we can gather, Slack knew less than a small boy in his first term at school. He was a butcher by trade, and one day at Hounslow Races he had " words " with the champion, who laid about him with a horse-whip. Thereupon Slack challenged Broughton, and the fight took place at the Amphitheatre on April l0 th, 1750. There was nothing elegant about Jack Slack. His attitude was ugly and awkward, he was strong and healthy but quite untrained in our meaning of the word. He only stood 5 feet 8^ inches but weighed close upon 14 stone nearly as much as his antagonist, who was a taller man. Broughton was eager for the fight or for the money to be derived from it. He regarded Slack with the utmost contempt and made no sort of preparation. So afraid was he that the butcher might not turn up at the last minute that he gave him ten guineas to make sure of him ! The betting was 10- 1 on Broughton when the men appeared in the ring. After all, as boxing went in these days, he did know something about defence, and he was master of two famous blows, one for the body and one under the ear, which were said to terrify his opponents. Slack stood upright, facing his man, with his right rigidly guarding his stomach and his left in front of his mouth. But that was only at the beginning. Directly he got into action Slack speedily forgot his guard. The art of self-defence was unknown to him, his was the art of bashing. He was a rushing slogger against whom a cool man's remedy is obvious. But he was also a glutton for punishment, and almost boundless courage and staying power, or”bottom," as they used to call it in those days. Regardless of the plain danger of doing so, he charged across the ring at Broughton, raising his hands like flails. Slack was noted for downward chopping blows and for back-handers, neither of which are or ever have been really successful. Broughton met this wild charge in the orthodox manner with straight left and right, propping off his man in such a way that the attacker's own weight was added to the power of the blows. For two minutes or so Slack was badly knocked about. Then they closed for a fall and Broughton's great strength gave him the advantage. But he was getting on in years and was untrained and in flesh. The effort of wrestling with a man of his own ponderous weight made his breath come short, and when next they faced each other across their extended fists the first dullness of fatigue already weighed on the old champion. He was a slow man, and had been used to win his fights by the slow and steady method of wearing down his antagonists. Slack was harder and stronger than he had supposed, but of course he would beat him this ungainly slogger who didn't know enough to avoid the simplest blow. But Slack, the rusher, was a natural fighter which, when all's said, is a very good sort of fighter indeed. He liked the game the fun of it, the sport of it. In spite of his bulk he was pretty hard. Standing square to his man with the right foot a little forward, he had no fear of his great reputation, he was quite untroubled by the stories of that terrible blow beneath the ear. He went for Broughton with a will. He would give him no time to remember his ringcraft. He would take cheerfully all that was coming on the way, and sooner or later he would get past the champion's guard. And presently Slack jumped in and landed a tremendous blow between Broughton's eyes. And the champion's face was soft from good living. He had not been hit like that for many a year. Both his eyes swelled up at once. flinched away, who stood so boldly and straight before his man, who, though slow and heavy, was so sure and never gave ground ? Slack stood away for a moment and Broughton came forward with his hands before him, feeling his way. Then the people saw that his eyes were entirely swollen up and closed. The man was blind. The Duke was slower than the others. “ What are you about, Broughton ? " he shouted to him. " You can't fight. You're beat." To which Broughton replied, vaguely turning his head about as though uncertain from which quarter his backer's voice had come, " I can't see my man, your Highness. I am blind not beat. Only put me in front of him and he'll not win yet." But Slack dashed in again and Broughton could not ward off a blow. Still strong, quite unbeaten in the literal sense of the word, he had to give in. It was an accident in the game and yet it was a part of the game. The whole fight was over in fourteen minutes. In order to compare those days with these, it is interesting to know that tickets for the Amphitheatre on this occasion cost a guinea and a half, whilst the money taken at the door besides fetched 150. Slack, as winner, was given the"produce of the house," which in all amounted to 600. When we have in mind the difference in the value of money then and now, we must realise that even in the early days of the Prize-Ring a successful boxer stood to win a considerable sum. The chief difference in his earning capacity lay in the fact that bare-knuckle fights were necessarily less frequent than the softer encounters of to-day. Nor was the sport widely popular at that time, the patrons and spectators being chiefly confined to publicans and other good sinners.